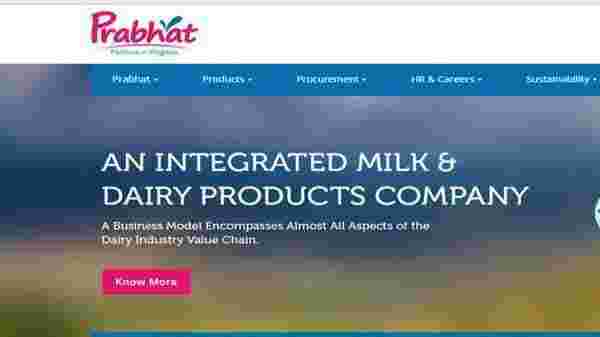 Investors skimmed 15% off Prabhat Dairy Ltd’s valuation after it announced a slump sale of its mainstay dairy business on Tuesday. The company will sell its milk processing business, which generates 98% of its revenue, to France’s Groupe Lactalis for ₹1,700 crore. At first glance, this seems a bit odd, because the company now has a market capitalization of ₹771 crore, which is less than half the value of the proceeds expected from the sale. Of course, there will be tax and transaction costs to reckon with, but even after adjusting for those, why should the company trade at a huge discount to the cash on its books? To start with, investors simply don’t like the fact that the business they had invested in has suddenly disappeared. They had bought the Prabhat stock for the dairy business and now suddenly find that the company will instead develop its fledgling cattle feed business and expand into areas such as animal nutrition and genetics. Note that the company got listed only in March 2015, when it had outlined a growth strategy for its dairy business in both retail and institutional categories. 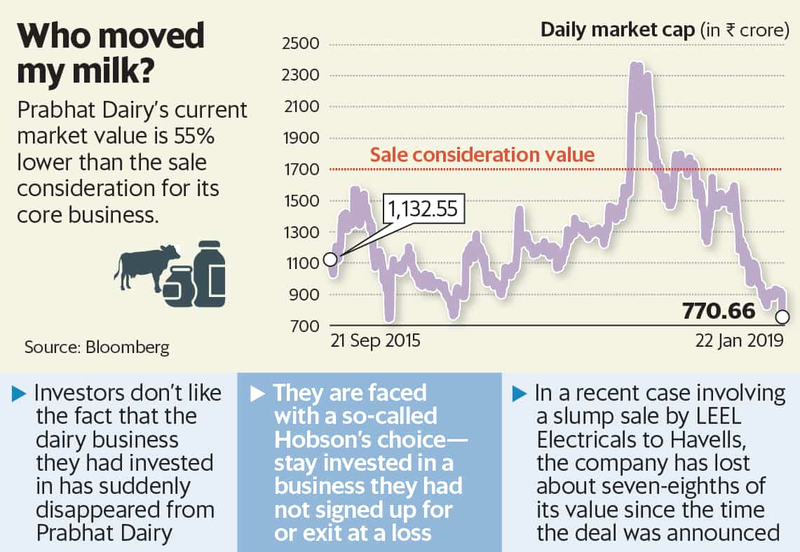 Who would have dreamt then that Prabhat Dairy will one day cease to have a dairy business? If, instead, the company’s promoters had sold their stake to Groupe Lactalis, which in turn followed up with an open offer, minority shareholders would have had the choice of staying invested under the new owner or perhaps exit at a handsome premium. But in the above structure, they are faced with the so-called Hobson’s choice—exit at a loss or stay invested in a business they had not signed up for. It remains to be seen if shareholders gang up and vote against the deal. History shows that similar deals have resulted in wealth erosion. As an article in Moneycontrol.com points out, in a recent case involving a slump sale by LEEL Electricals Ltd to Havells India Ltd, investors lost a lot of wealth despite the fact that the sale was done at a decent valuation (bit.ly/2Mr74n0). The company has lost about seven-eighths of its value since the deal was announced. With this backdrop, investors despise too much cash sloshing around a company’s books. “Investors are concerned how much of the cash they will get to see. A similar situation was witnessed during the Lloyd and Havells India deal, where wealth has eroded,” said an analyst at a domestic broking house. Prabhat Dairy’s management has said it “intends to share a substantial portion of the proceeds from the sale with shareholders”. Investors have the difficult task of deciding whether to stay and find out how much cash is eventually returned. “Cattle feed is a low-margin, high working capital business. So, there can be high demand of cash from that business. Also, the company has no past experience of running this business, which means that net-net investors have no incentive to hold the stock,” added the analyst mentioned above. Prabhat Dairy could assuage investors’ concerns by announcing a large dividend that compensates shareholders for the value of their holdings at the time of the sale announcement. At the company level, that would mean a dividend payment of at least₹900 crore, which is where its market cap was before the deal was announced. The sharp sell-off in the company’s shares on Tuesday suggests investors are assigning a low probability to such an outcome. The broad lesson for investors is that they need to be prepared for the risk of being invested in a company that suddenly exits the business that they had signed up for.